In a rural area transport to school is a big issue. In many secondary schools in Suffolk most of the children arrive by bus from outlying areas. 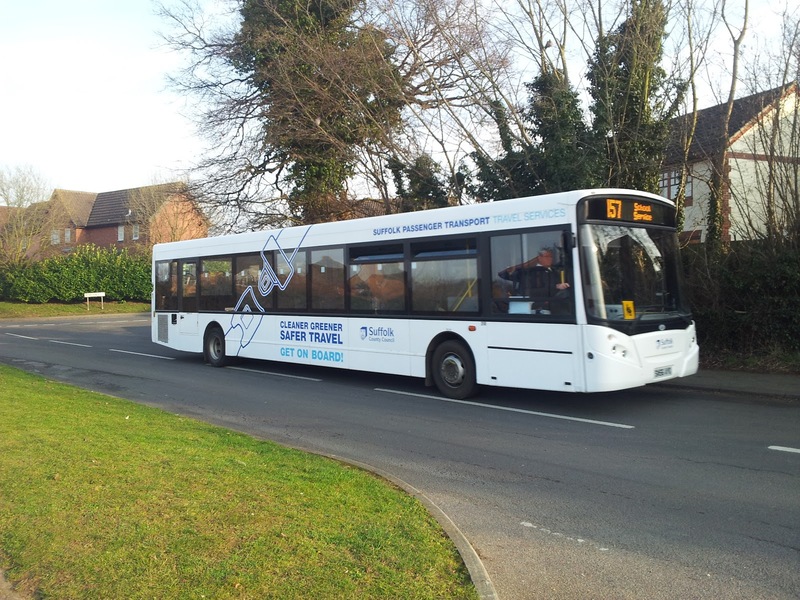 In most cases these buses are provided by the County Council free of charge. The County Council has a well organised transport plan with the idea that schools have catchment areas essential to both organising the transport and deciding when a parent should pay for that transport rather than it being provided free of charge. Free schools and to a lesser extent convertor academies are having quite an impact on this with Stour Valley Community School. I wrote quite an extensive blog post about this called Free School, Free Travel detailing how the County Council are continuing to pay for children to travel to the new Stour Valley Community School when they would not normally do this under the same circumstances elsewhere in the county. On transport, there is a threat that should we end up having to offer transport to the nearest school for those living over three miles, (this is a policy a number of authorities are now starting to operate, irrespective of whether it thwarts choice—it is simply a way of limiting the spiralling costs of home-to-school transport) there is a slighter greater number for whom that location is the Middle School building as opposed to SJL, reflecting the strong bias to the east of the town for the traditional catchment area (eg Worlingham) However, at the moment, SCC has been meeting costs in some areas of contention, eg around Stour Valley (Clare) vs the Haverhill academies in order to facilitate choice. In the Thurston area there are concerns that the County Council will not pay for children from the North of the County to attend Thurston Community College (as they do now) but they will have to attend the nearer free school - or pay (if the parents can afford to) for transport. I also have some concerns that the Seckford schools are overtly saying they will only have an "academic" curriculum with a comprehensive intake. Could it possibly be lawful to say that if a school has a restricted curriculum offer they will be treated like a faith school? If so, are there criteria we could use? Obviously school transport is more generous for poorer families but also more important in the choices they make. Without stereotyping it is possible that there will be occasions where the parent may feel a Seckford Free School will not meet their child's needs, but cannot afford to make that choice. Any clever thoughts? I am worried that we are taking the saving up at the same time - I think Graham could spend the transport budget several times over if we let him. So the political desire to facilitate choice (well if you chose a free school at any rate) is pitched against cold hard economic reality. Who is going to pay for the choice? As Simon White says like any politician Graham Newman could probably spend the budget many times over offering choice to all. I think if I were a parent say in Stanton and was looking forward to sending my child to the outstanding Thurston Community College and was told I now had to pay (assuming the County even provide a bus at all) or that I had to send my children to an unproven free school with a narrow curriculum I would not be happy. The Free school group want Suffolk to provide free travel for all and pay for parents to go to either Ixworth or Thurston. But can the County afford this and if it can is it fair? Nobody pays for my choice to send my child to a school out of catchment. If the whole County moves to a "nearest school" policy to save money then in areas (like where I am) where the catchment policy is working fine people could lose out. There is a real concern to me that in a mad rush for an ideological and seemingly "cheap" (because the buildings are "free") free schools that really important practical issues are overlooked or swept under the carpet. The cheerleaders of "choice" could well be defeated not by ideology but by something as boring - but important - as transport. This is the final part of the series revelations from the Freedom of Information request on free schools - there will be a few more "free school FOI shorts" and over the weekend a few comment pieces on what the FOI shows. The full FOI will also be published on the Wikisuffolk site.